In labs around the world, robots are sprouting legs. Engineers are fine-tuning their abilities to walk, climb, and stay balanced so they can carry heavy loads or scout hazardous environments. Just a few years ago, many of the elite robots at the DARPA Robotics Challenge struggled with simple tasks. But robots are becoming more nimble all the time, and the age of awkward, clumsy machines is receding. Many of these impressive robots don’t look particularly humanoid — or friendly. Handle, the newest limbed robot from Boston Dynamics, has even been described as “nightmare-inducing” by company founder Mark Raibert. Others scuttle along with an unsettling resemblance to spiders, ostriches, and mammals. But their freaky designs are meant to help these robots move about more easily, both in remote wilderness and human cityscapes. Soon, legged robots will walk among us, and their inventors are already planning how they will make our lives easier and safer. Here are a few of the newest generation of bizarre-looking but mobile robots. Most robots move about on wheels or tracks. In many situations, that’s all they need. “Wheels are probably unbeatable in speed and efficiency,” says Marco Hutter, head of the Robotic Systems Lab at ETH Zurich in Switzerland. On flat ground, like you’d find on a road or in a shop or warehouse, wheeled robots excel. And tracked robots have their uses, although they cannot climb over anything longer than their bodies. “If you’re trying to go through deep, sticky mud over and over again like construction equipment [does], tracks are appropriate,” says Damion Shelton, CEO and co-founder of Agility Robotics. But many areas where humans work, like industrial sites, forests, or collapsed buildings, aren’t suited for wheels or treads. These landscapes are full of obstacles, and finding another way around them would sap time and battery life. “Legs are probably the ultimate way to get around anywhere,” Hutter says. For rugged wilderness, four-legged robots are useful. These can be big and bulky so they can carry heavy loads, like Boston Dynamics’s BigDog. Others are smaller and spryer. Ghost Robotics’ Minitaur is a small, lightweight robot that can scamper over rocks or urban debris. It can also run, jump, climb, crouch, and bounce up onto its back legs to open doors. Minitaur can adapt its gait to handle varied terrain, from stones to snow to sand to concrete. It uses a simple design that sends feedback from its “feet” about what kind of turf they are striking right to its motor. The feedback it gets from different surfaces will dictate how Minitaur moves its legs. In a new environment like icy pavement, it might scramble about for a moment, then start to adjust its gait. The simplified design will make Minitaur light, relatively cheap, and less fragile than some models, Parikh says. In the future, the team might make Minitaur more autonomous by adding lightweight sensors (like LIDAR or cameras) to help it navigate. They might also add sensors to collect information on things like radiation or weather. They envision it collecting samples for scientists in the field, or helping with search and rescue missions. In future, the team would also like to give Minitaur flippers so it can swim. 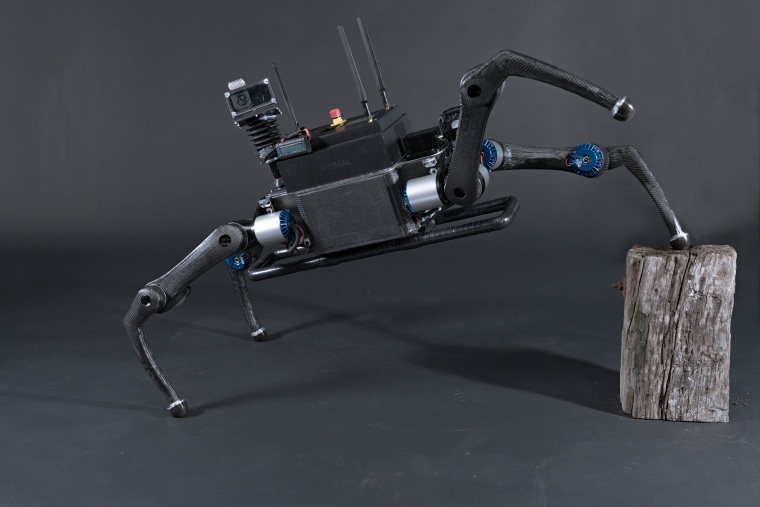 Another four-limbed robot is ETH Zurich’s ANYmal. It, too, is designed for rough terrain, and can run, climb up stairs, and pick itself up after a fall. Unlike Minitaur, it already sports sensors to help it navigate. ANYmal uses lasers to take 100,000 measurements per second so it can build a map of its surroundings, figure out the best path to take, and start choosing where to place its feet. Over the next two years, he and his colleagues plan to test ANYmal in mud and water. Like Minitaur’s creators, they are thinking of sending it in search and rescue operations, using sensors like microphones, cameras, and thermal cameras to find trapped people. They also want to use it to inspect oil and gas sites, where it can scuttle about, checking temperature or pressure meters or searching for gas leaks. Often, two legs are the most attractive option on man-made terrains. “Human designers have designed our environments to work well for us,” Shelton says. “If you’re outdoors and you’re trying to go up icy steps in the winter and then walk down an alleyway between two buildings and then deliver a package, that’s the sort of thing where the two legged posture” comes in handy. Some designers try to have it both ways; Handle can use its front limbs to pick up parcels or balance while it zooms over smooth floors and stairs on its wheeled hind legs. Agility Robotics took another approach with Cassie, a robot with two sturdy legs that allow it to strut like an ostrich. It was designed to be lightweight and tough, so it can fall without hurting itself. “The outdoors is complicated, and you’re always going to slip and fall and tumble,” Shelton says. “You wouldn’t think of designing a car to be wrecked 20 times a day, whereas that is a specific design goal for Cassie.” It can also stand in place, crouch, and keep its balance on a gently rocking dock; in the future, Shelton says, Cassie will also sport little arms. Agility Robotics is planning to use future generations of Cassie for tasks like telepresence, inspecting industrial sites, and curb-to-doorstep package delivery. Cassie wouldn’t replace people, Shelton says, but work alongside them to take over tedious tasks like hoisting packages. “A big portion of their job…is scheduling pickups, dealing with customer service issues, and that’s not something that’s quite as easy to automate,” Shelton says. Cassie comes from a line of robots inspired by flightless birds, but its ostrich-like appearnce was a bit of a coincidence. “In the case of Cassie you start with a biological system, do some math and turn it back into a design, and get something back that looks physically what you started with,” Shelton says. But sometimes, robots that share an unsettling resemblance with living creatures are the best tools to get the job done. These agile, legged robots will prove their mettle on mundane stairs and driveways and in dangerous sites inaccessible to wheeled or tracked robots. “There’s so many areas where we still have to send humans to do the work where we really don’t want to have humans,” Hutter says. One day, we may be able to remove workers from harm’s way, and instead send legged robots galloping into burning buildings, over rubble, and into sewers or sites steeped in nuclear waste. These robots are still learning to walk, but wherever people go, they will follow.